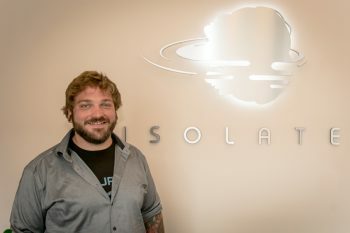 My name is Ben Gleason and I am the President and Owner of Isolate Flotation Center. For as long as I can remember, I struggled with anxiety, depression, addiction and obesity. I had been having suicidal thoughts since I was 10 years old. By the time I was 22, I weighed 300 pounds, ate fast food for basically every meal, smoked a half pack of cigarettes a day, hadn’t thought of exercising in years. I felt like my body was deteriorating and I was completely miserable. Toward the end of my worst years, my roommate started listening to the Joe Rogan Experience Podcast. I would listen with my roommate and soon started listening to every episode. On the podcast they talked about everything from comedy to consciousness and I was hooked! One day I heard Joe talk about his Flotation Tank. The way he described floating and the potential benefits of using a Flotation Tank grabbed my attention instantly. I found a place to float as soon as I heard Joe talk about it and had my first float that week. It was a strange and wondrous experience. The first 50 minutes were an obscure journey through my conscious and subconscious minds. In such an alien environment, I had very little to attach to and eventually, inevitably, felt a strong sensation of letting go. After 50 minutes of floating my anxiety stopped for a brief period of time and I finally felt relaxed. It was the first time in my life I had felt this good. I felt centered, at peace and yet vibrant all at the same time. I felt beautiful, which was something I had honestly never felt before. I felt completely loved and supported by the universe. It was the best 10 minutes of my life! Then came a knock on the door, “time to get out” they said. The knock was startling but not as upsetting as the fact that I had to leave this beautiful plane of existence. I came back the next day. I had to have more. That week I was looking in the mirror and had a moment of complete honesty with myself, the first moment like this I’d ever experienced. I finally saw that I wasn’t putting in the effort it took to live happily. I looked at how happy people live their lives and I started mimicking them. I started eating organic food, practicing Brazilian Jiu Jitsu, Yoga, and positive thinking. I began replacing my suicidal thoughts with thoughts I wanted to hear. “I am beautiful” I would tell myself, and I actually believed it! I quit smoking cigarettes and never looked back. I was floating throughout this process and I began to notice how the Float Tank kept me honest with myself. The experiences I had floating helped me to know what it felt like to be centered and free of stress. Understanding this feeling helped me to see all the things I did in my daily life that prevented me from feeling centered, things like smoking cigarettes, eating food that lacked any nutritional value and negative thought patterns that were all but cemented into my brain. It helped me figure out what I needed to change and what I had the power to change. All I needed to do was change! And I did. A year after my first float I weighed 195 pounds, hadn’t had a cigarette in almost a year, drank kale shakes every day and exercised like a maniac. Every moment of my life was filled with more joy than I had experienced in my entire life combined. It was freeing, rewarding and empowering. It was then I realized that part of my purpose was on this planet is to spread the joys of floating to all who are ready to receive them. I opened Isolate Flotation Center in May of 2012 and have thoroughly enjoyed sharing the float experience with others. I’ve been fortunate enough to watch so many people courageously confront fears, work through difficult issues, and finally give themselves the respect they deserve. It is one of the most beautiful things I’ve ever been involved in and I can’t wait for you to come share the beauty! See you soon!